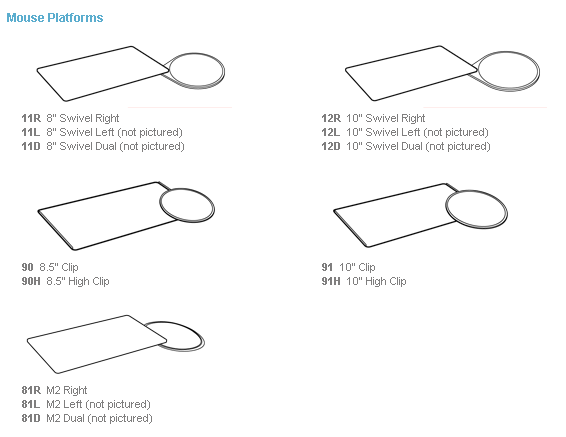 2 Select: Keyboard Platform?900 Standard: 16" x 10.625"950 - Standard Compact:19" x 8.4"500 Big: 27" x 10.625" 550 Big Compact: 25" x 10.625"
A key component of an ergonomic workstation, a well-designed articulating keyboard system works in conjunction with a monitor arm and task chair to promote healthy, comfortable posture. Humanscale keyboard supports literally bring the work to you, allowing you to sit back in your chair while providing serious protection from carpal tunnel syndrome, neck and back pain, and other musculoskeletal issues. 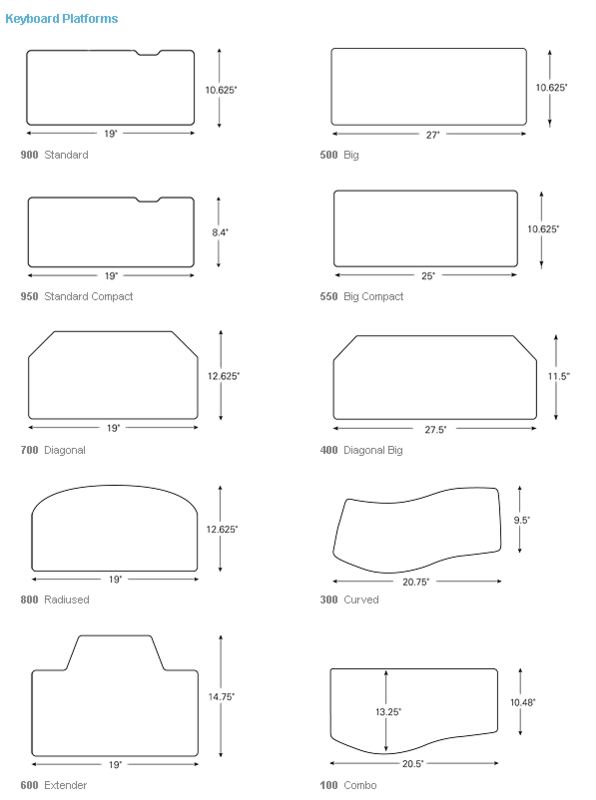 900 Standard: 16" x 10.625"
950 Standard Compact: 19" x 8.4"
500 Big: 27" x 10.625"
550 Big Compact: 25" x 10.625"
We work hard to ensure that our environmental philosophy is reflected in each product we create. With our Design for Environment protocol, our designers and engineers examine the environmental impact of every choice made throughout the design process—from initial concept through final production. We invite you to read more. 1. 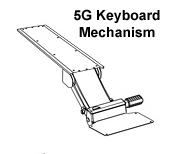 Why is it ergonomic for a keyboard tray to have a negative tilt? Backed by years of research, ergonomists universally agree that using a keyboard in a negative tilt encourages a neutral wrist posture--meaning your wrist is neither bent nor flexed. Keyboarding in a negative tilt minimizes the risk of carpal tunnel syndrome and other musculoskeletal disorders (MSDs) while reducing contact stress on the inside of the wrist. 2. 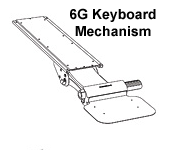 Do I have to lock the arm in place when I move a keyboard support up or down? No. 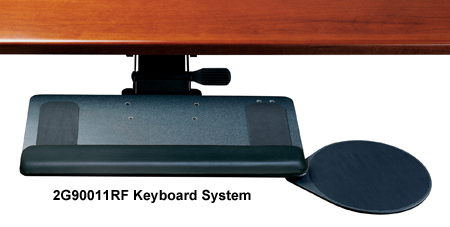 Humanscale's award-winning keyboard supports can be adjusted up or down by simply tilting the platform and moving them into the desired position. 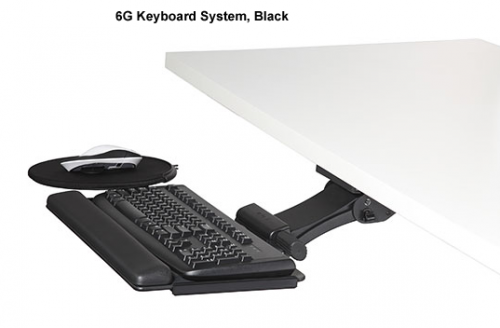 Once you've found your optimum height, the keyboard arm automatically locks in place when released. 3. What are Humanscale keyboard and mouse platforms made of? 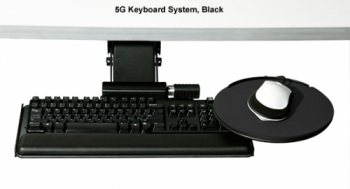 Our keyboard and mouse platforms are made of phenolic, an ultra-strong composite made of wood pulp and resin that’s durable, non-toxic, and easy to clean.